Hard times for the Galaxy, dark forces move in the shadows as the Empire dominates its opposition. But young Han Solo is not yet ready to join the eternal fight between Good and Evil. After being disconnected with his love Qi’Ra, the plucky pilot reaches out to a group of smugglers to help fund his journey back to Qi’Ra on home planet Corellia. Entering a life of gang culture brings many competitors, foes and furry allies. You may be forgiven thinking this latest Star Wars® instalment feels like the arrival of a second London bus with Disney’s rollout of tales from a galaxy far far away getting into full swing. With the rumours of acting coaches needed on set as well as the high profile news of the original directors Lord and Miller leaving due to disagreements with Lucasfilm, the reason why some fans would be sceptical in seeing this adventure is comprehensible. Furthermore, the pleasing experience of Rogue One and the controversial The Last Jedi showed the difficult balance directors must achieve. Making a good film is not enough; it must satisfy the demanding fans of the George Lucas trilogy. Eventually Ron Howard was given the challenge of rescuing the situation. Solo does not ease you in to the story; instead it dives straight into the action and doesn’t give you much time to breathe for the first third of the film. Seeing the beginning of Han Solo and Chewbacca’s relationship, and how it blossoms throughout the movie is a real treat that pulls at the heart strings of Star Wars fans. However the development of the myth of our main character is only partially achieved with some elements feeling forced just to provoke a reaction from audiences. For example, witnessing Han flying the Millennium Falcon for the first time is extremely impactful, whereas the origin of his name feels uninspiring. Built as a heist movie, it brings flavours of a classic western with notes of espionage and war, where our hero acquires the traits of a brave and smart cowboy with a rough but deep humanity. Solo balances the comedy and seriousness very well with Chewbacca representing the comedic relief, an approach that differs from The Last Jedi where the comedy is spread more across the board and unfortunately fails on many levels. Most of the action sequences provide an entertaining and fun experience, but when the film delves into the story it lacks the necessary draw to create a coherent flow of events. The final act indeed does feel slightly rushed and disjointed. Despite this, the creation of new creatures, the visually impressive locations and the epic score in which you immediately recognise the influence of the legendary John William’s, offer the right ingredients for an enjoyable Star Wars chapter. 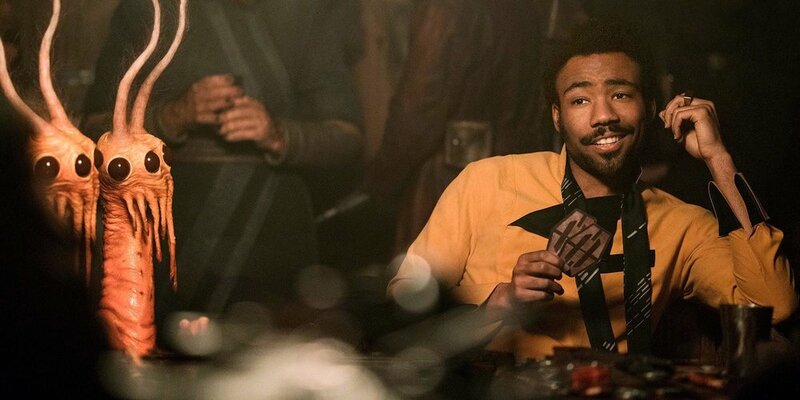 Similarly, the introduction of new characters such as Qi’Ra (Emilia Clarke) and Tobias Beckett (Woody Harrelson) provide good supporting roles, but it is Lando Calrissian played by Donald Glover that is most memorable with the actor expanding on the character from the original trilogy and leaving a taste of wanting to see more from him. In conclusion Solo: A Star Wars Story provides the action, charm and above all a fun time at the cinema. With huge Harrison Ford sized shoes to fill, Alden Ehrenreich certainly makes a good fist of things, but overall it does not add much more to the overall saga that has not been done before, although an unexpected surprise towards the end may whet the appetite for a sequel. The upcoming sequels and spin-offs confirm endless attraction to the Star Wars universe with many directors ready to put their mark on the saga. Whether it breathes new life into the franchise or kills part of the reputation the risk is high, but this chapter has survived and will play the next round.